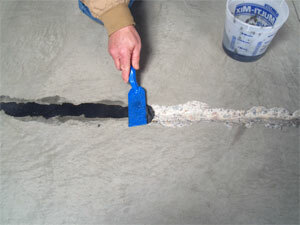 Use Roadware 10 Minute Concrete Mender™ in bulk for repairing spalls and cracks greater than 3/4″ in width. 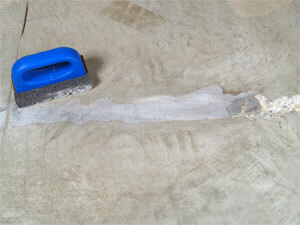 Clean cracks and spalls down to solid white concrete and remove all dust and debris prior to application. Click here for our bulk application video. Pour 4 oz of Side A into a measuring container. 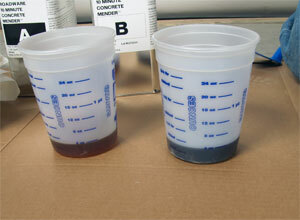 Pour 4 oz of Side B into a measuring container. 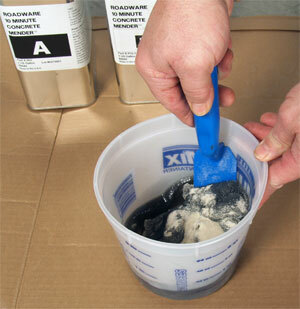 Roadware 10 Minute Concrete Mender™ should always be mixed at a one to one ratio by volume. Combine Side A and Side B into a larger container and mix by hand for about 10 seconds. 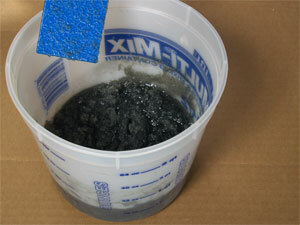 You will now have 8 ounces of mixed Concrete Mender. 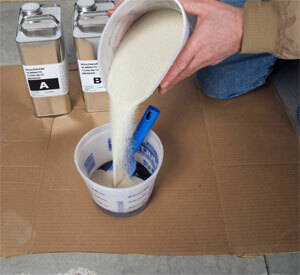 Immediately add up 16 – 20 ounces of silica sand and mix with a trowel. 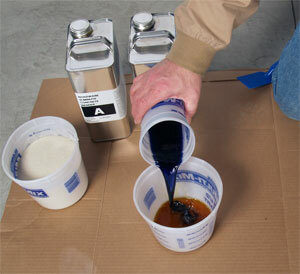 Mix until the sand and material is well blended. It should take about 10 seconds. A good way to judge a proper sand to liquid ratio is to tap the side of the pail. If the mix looks wet on top, you have the mix just right. Working quickly, place the material into the the prepared repair area. 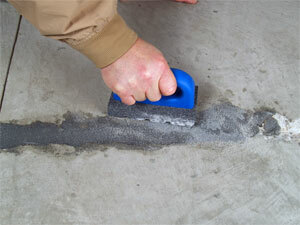 If the concrete is clean and sound, priming with pure material is not needed. 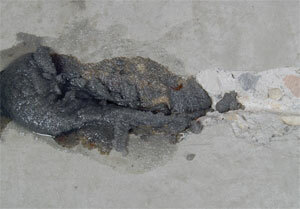 Trowel some back to confirm you are wetting out the concrete surface. 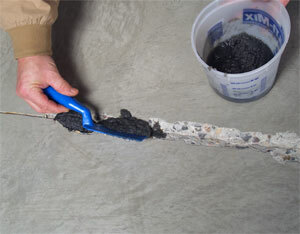 This insures Microdoweling™ action into the concrete. Trowel off the material as needed. Be careful not to overwork the mix. 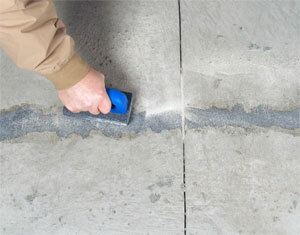 After 10 or 15 minutes at 70 degrees F, blend the repair into the surrounding concrete with a finishing brick, grinder or polisher. Use extra silica sand as a grit to give you a smooth finish. Repair is now ready for coating, polishing, or heavy traffic. Workers may be exposed to dangerous levels of silica dust when cutting, drilling, grinding, or otherwise disturbing materials that contain silica. These materials and tasks are common on construction jobs. Breathing that dust can lead to serious, often fatal illnesses. Click here to learn how to work safely with silica.